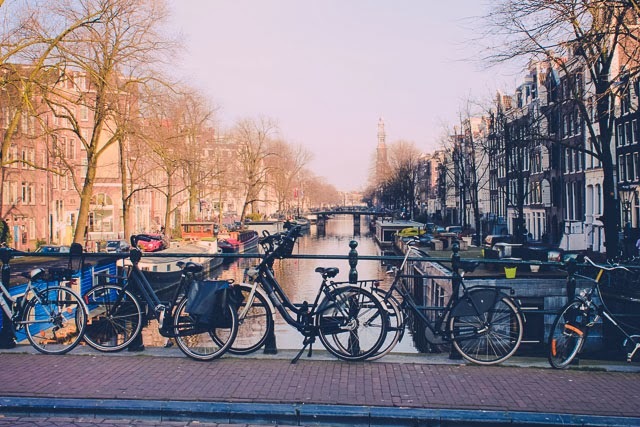 When thinking of our upcoming trip to Amsterdam I pictured canals, bikes, houseboats, museums and typical European architecture. It wasn't until my sister made a comment about marijuana a couple of days before our departure that I remembered there was another side to this Dutch city. 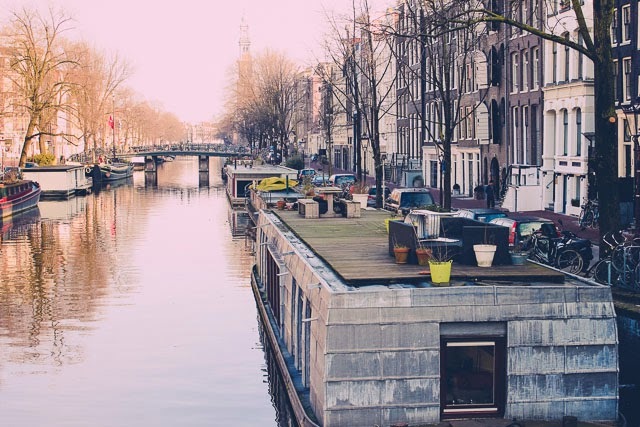 I suppose my Amsterdam references for the last few years have been other bloggers (Liz, Rachel & Carly - although they all have now left the city) and there was nary a mention of drugs or prostitution. 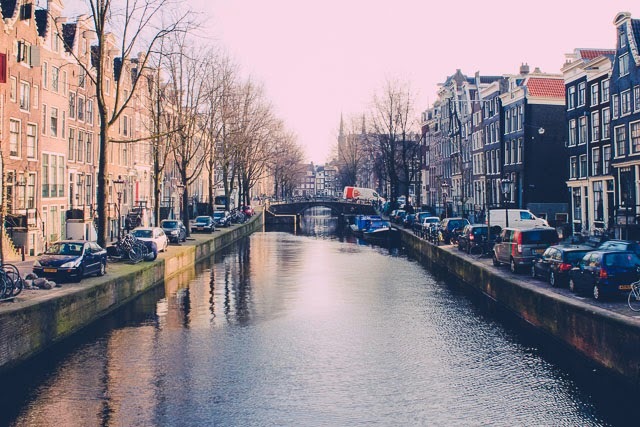 In my younger years, Amsterdam was known as the place to go for things that were illegal to us in Canada and should you mention you were visiting the city, there would most definitely be a joke thrown out about smoking weed. I suppose, for most of us, it was a distant land that we'd never experience for ourselves and thus, we went off the few references we had of it. I later made a comment to Joe that this must be telling of my age - the party atmosphere of a city is no longer on my radar. It's also funny that we were both taken by surprise upon arrival at what a party city it is. As a Canadian (and probably an American,) if you're planning a trip to party, you go to Vegas. Apparently, the British go to Amsterdam. As we wandered through some of the more touristy nightlife areas, it was wall to wall groups of women on hen-dos dressed in matching t-shirts or wearing tiaras. There were large groups of inebriated men, clearly enjoying the more liberal side of the city. This wasn't really our scene and we quickly found ourselves sticking to the quieter areas. 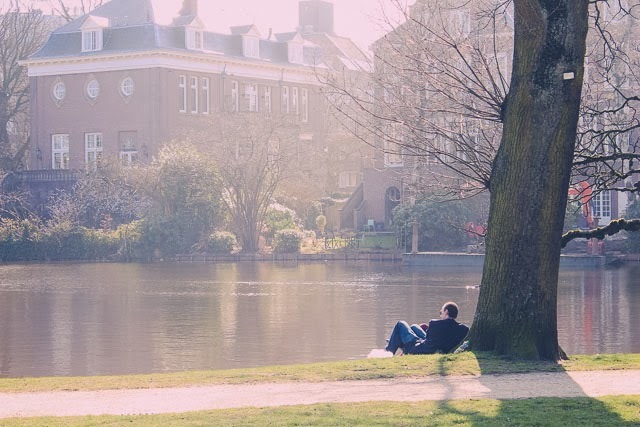 But, of course, anyone that has visited Amsterdam knows that there is so much more to the city than coffee shops and prostitutes. Away from the assembly of drunk tourists, there is a very beautiful city. The canals lined with beautiful buildings, houseboats which I so desperately tried to peer into, bikes lining every section of free space often several deep and bridge after bridge beckoning me to take photos. As usual, we spent the weekend walking. We lucked out in that Amsterdam was experiencing unseasonably warm temperatures. (It got to 18 degrees C on Sunday!!!) We wanted to take advantage of the Spring weather so most of our time was spent outside. We visited the Anne Frank House (incredibly moving,) looped through Jordaan and Nine Streets, started each morning with long and yummy breakfasts, took a canal cruise, briefly made our way through the Red Light district in both day light and under the red lights, and we spent a few hours in Vondelpark. The atmosphere was almost electric as everyone took to the outdoors to soak in some much needed sunlight and we couldn't help but feel energized after a dark winter. Amsterdam was both exactly as I pictured yet also different than I expected, if that makes any sense. Both of us felt an attraction to the city and we both mentioned on a couple of occasions that we could see ourselves spending a few years there, should an opportunity arise. It strikes me as a city that will always have something unexpected to discover. -We stayed at Hotel Roemer. It's a boutique hotel located just outside the main loop but an easy 5-10 minute walk into main areas. Had we found a deal or wanted to spend a bit more money on accommodation, we might have stayed in the Nine Streets area. -I tried to buy Anne Frank tickets a week in advance but they were sold out. Only a certain number are released online and they're sold by time. Our wait in line on site was about an hour long. The line was crazy but it actually moved pretty quickly. -We originally were going to get on a canal cruise from nearer to Central Station yet the lines were huge!!! Instead, we jumped on one near our hotel, Vondelpark & the Rijksmuseum and there was no wait. You did have beautiful weather, and those photos look so dreamy! That tip about the Anne Frank is awesome! I'm heading over there in August and I just reserved my tickets. That happened to us in Hawaii too, tried to make a ticket reservation for Pearl Harbor a week before and found them to be sold out. Thanks for sharing! So lovely, I'm so excited for us to spend a few days there in October. I love the third to last photo of the man leaning against a tree. Beautiful! I rarely think of that side of Amsterdam anymore! I always think of the beautiful rows of houses. Great photos! Amsterdam is definitely on my list of places to go. I have no interest in the weed or red light district but I think walking along the canals would be amazing! And the Anne Frank house is a must! Such a gorgeous place, you captured it wonderfully with these photos! I just finished watching a documentary on the Anne Frank house, it would be amazing to see in real life. I'm so glad you guys enjoyed your trip! This couldn't have come at a better time - we've just decided to go to Amsterdam in two weeks and I'm so excited especially after seeing your post! Have a great trip, Edna! I hope the weather is as lovely for you as it was for us! I was so surprised to find so many charming and quiet neighborhoods near the party area. 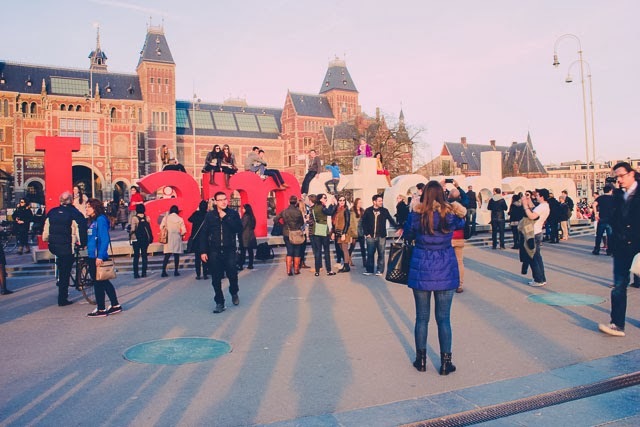 Amsterdam has so much more to offer than people realize! that's so funny because when I went to visit Liz, we were walking around and I smelled weed and only then did I remember that Amsterdam is so popular for that! I just love Amsterdam though. If it wasn't so cold that would be on a top place for me to live. Wow - you had amazing weather! Between John and I, I think we've been to Amsterdam more than 15 times, haha. I'm not ashamed! 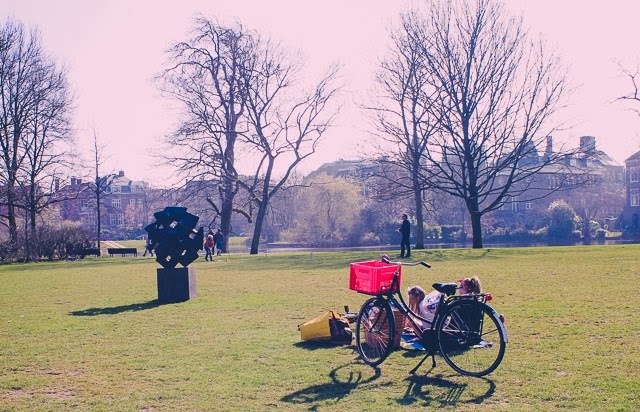 It's a beautiful city, lots to do and you're right...get out of the center and into some of the quieter neighborhoods and parks and it's bliss. There are some really great markets and restaurants and the vibe is always good. oh beautiful! 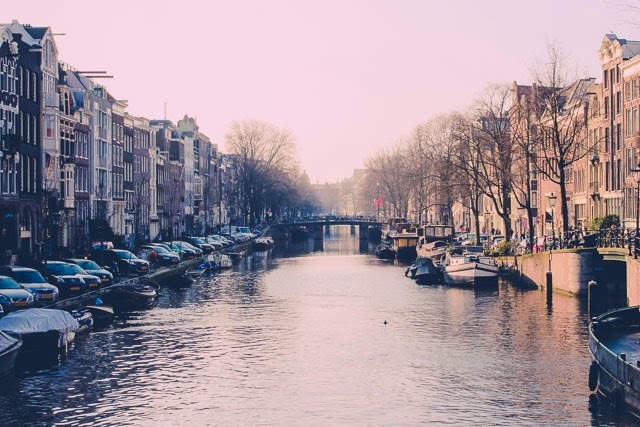 I think we've talked about this before, but Amsterdam has always been one of my "oh, we'll get there eventually" places but I think it needs to move up the list! 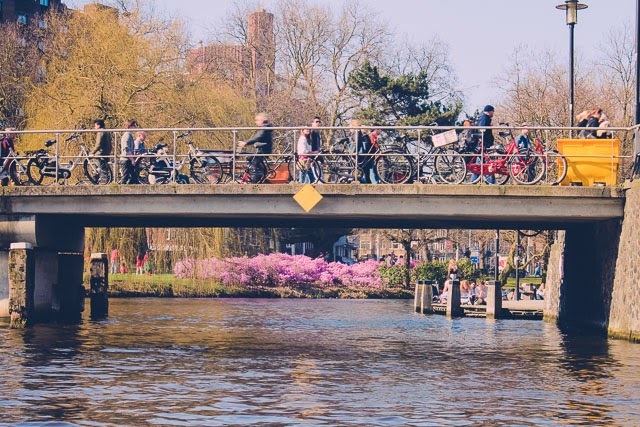 maybe because I'm an art history person or because I'm not a huge scene person, but I'm with you - when I think of Amsterdam, I think of the canals and the bikes and the tulips and the painting and things! 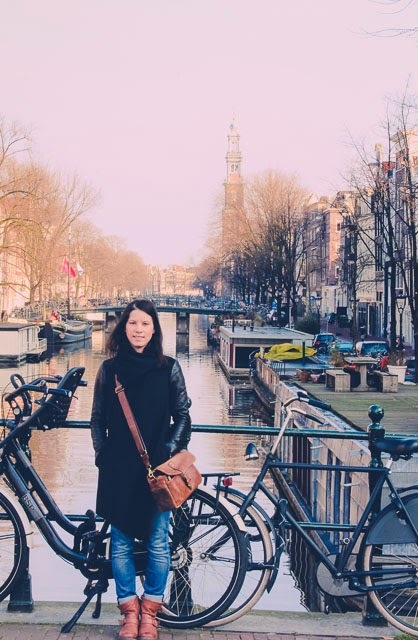 A while ago, a travel blogger I sometimes read posted about her experiences in Amsterdam and EVERYTHING revolved around the cafés. Honestly, it made me kind of sad. Like, if you want to smoke pot and party, fine, but there's SO MUCH MORE to the city than that! It does seem to be known as a place to party and have a good time ... but it is nice to read about the other side. Not all visitors want to drunken experience (I find at my age too, it would not be on my radar either). I have never been, but look forward to reading more. 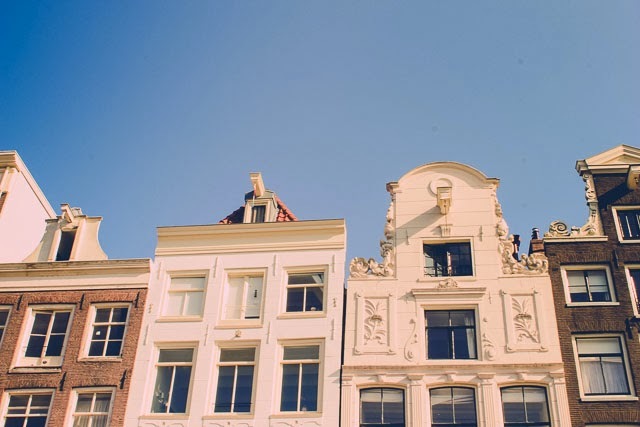 Both my husband and I LOVED Amsterdam, everything about it. Well, except maybe the prostitution.... :) We stayed clear of the party scene on all but one night, so most of my memories of Amsterdam are the typical things you think of - canals, bicycles, pretty row houses. I loved being there and I'd go back in a heartbeat!